Alaskan Ethnic Group: Both St. George and St. Paul are predominantly Aleut, with a small Eskimo and Indian population. 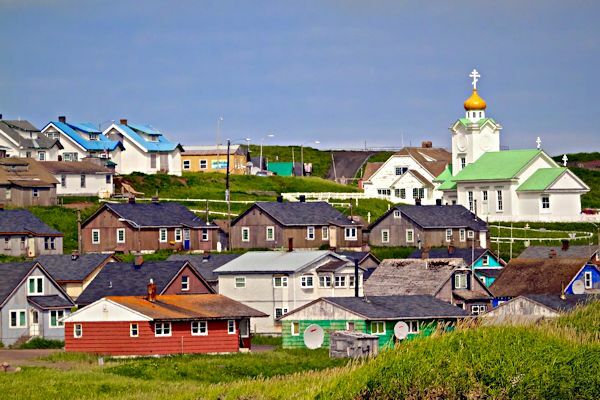 The Pribilof Island seal population and the community’s dependence on it has been a major influence on the local culture. 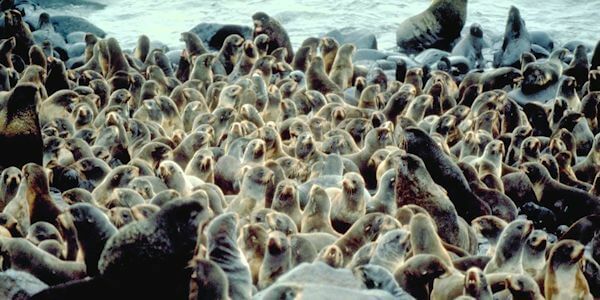 More than a million fur seals congregate on the islands every summer. The Pribilofs were discovered in 1786 by by Gavrill Pribilof of the Russian Lebedov Lastochkin Company while looking for the famed northern fur seal breeding grounds. They landed first on St. George. The island was named Sveti Georgiy, and its larger neighbor to the north was originally called St. Peter and St. Paul Island. In 1788, the Russian American Company enslaved and relocated Aleuts from Siberia, Atka and Unalaska to the Pribilofs to hunt fur seals; their descendants live on the two islands today. In 1870, the Alaska Commercial Company was awarded a 20-year sealing lease by the U.S. Government, and provided housing, food and medical care to the Aleuts in exchange for seal harvesting. In 1890, a second 20-year lease was awarded to the North American Commercial Company, however, the fur seals had been severely over-harvested and poverty ensued. The 1910 Fur Seal Act ended private leasing on the Islands and placed the community and fur seals under the U.S. Bureau of Fisheries. Food and clothing were scarce, social and racial segregation were practiced, and working conditions were poor. 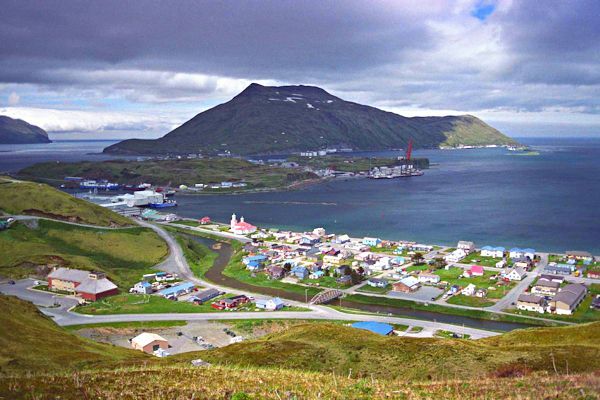 In 1979, the Aleut Islanders received $8.5 million in partial compensation for the unfair and unjust treatment they were subject to under federal administration between 1870 and 1946. In 1983, Congress passed the Fur Seal Act Amendments, which ended government control of the commercial seal harvest and the federal presence on the island. Responsibility for providing community services and management of the fur seals was left to local entities. $20 million was provided to help develop and diversify the Island economy – $12 million to St. Paul and $8 million to St. George. Commercial harvesting on St. Paul ceased in 1985. Ownership of fur seal pelts is now prohibited except for subsistence purposes. The climate of St. Paul is arctic maritime. The Bering Sea location results in cool weather year round and a narrow range of mean temperatures varying from 19 to 51. Average precipitation is 25 inches, with snowfall of 56 inches. Heavy fog is common during summer months. St. George is accessible only by air and sea. There are two airstrips, one owned by the City, and a newly-constructed State-owned airport with a 5,000 foot gravel runway. Scheduled flights are provided to St. Paul and the mainland. Most freight and supplies are delivered by ship from Anchorage on a monthly or bimonthly schedule; cargo from Seattle arrives five or six times a year. There are three docks; one operated by the village corporation. An inner harbor and dock were recently completed in Zapadni Bay, 5 miles from the City. St. Paul is accessible by sea and air. The State-owned gravel runway is 6,500 feet in length, and is undergoing major improvements. Regularly-scheduled flights are provided, under Visual Flight Rule conditions. Most supplies and freight arrive by ship. There is a breakwater, 700 feet of dock space, and a barge off-loading area. On St. George, a piped water and sewer system was constructed by NOAA during the 1950s. Four wells provide water for the community and the harbor, with 250,000 gallons of storage. All 60 residences are connected to the system and are plumbed. Funds have been requested to replace the failing 45-year-old water storage tank and distribution mains. Sewage outfall discharges into the harbor. The City provides refuse collection services. NOAA is completing a federal hazardous waste clean-up on the island, and will close the existing landfill. On St. Paul, water is supplied by wells and an aquifer and is treated. There are three 200,000-gallon storage tanks, and a total capacity of 3 million gallons per day. All 167 homes and facilities are connected to the piped water and sewer system and are fully plumbed. An ocean outfall line was recently added for seafood processing waste. The City collects refuse, and has started a solid waste reduction and recycling program. A landfill, incinerator, sludge and oil disposal site have recently been completed. A new $3 million power plant is nearing completion. A small wind turbine provides power and hot water to the village office and a greenhouse, but it is not connected to the power grid. The federally-controlled fur seal industry had dominated the economy of the Pribilofs until 1983; the two communities remain closely tied. On St. George, most employment is in government positions and commercial fishing. 11 residents hold commercial fishing permits for halibut. The St. George Aquaculture Association has begun salmon and shellfish programs. Puffin Seafoods, a small halibut freezing facility, opened in summer 1998, and floating processors operate seasonally offshore. St. George harvests 500 fur seals each year for subsistence purposes. Halibut, reindeer, marine invertebrates, plants and berries also contribute to the local diet. St. Paul is a port for the Central Bering Sea fishing fleet, and recent port and harbor improvements have fueled economic growth. The local commercial halibut fishery got its start in 1981, and a Trident Seafoods crab processing plant was built in 1989. 30 residents hold commercial fishing permits for halibut. Cold storage was also recently completed. Unisea and Icicle fish processors operate near the harbor, and up to nine offshore processors are serviced out of St. Paul. Fur seal rookeries and more than 210 species of nesting sea birds attract almost 700 tourists annually. The community is working to develop eco-tourism. There is also a reindeer herd on the island, from a previous commercial venture. St. Paul residents subsist on halibut, fur seals (1,645 may be taken each year), reindeer, marine invertebrates, plants and berries.